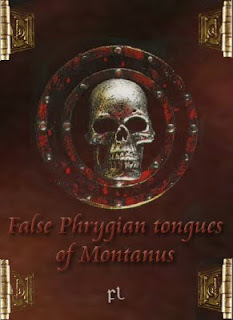 It was then that the false Phrygian tongues of Montanus tried to continue them with a demonic imitation! Montanism might be viewed alternately - regardless of what its founder(s) believed this “New Prophecy” represented - as an independent mystery religion, separately practiced while simultaneously overlapping the various Anatolian Christianities, ‘pagan’ cults, and state-sponsored religions of the eastern Roman Empire. Tinanea omjei omako 30 uarko ijzcy omjem Jijem keog ta JEK100 jicy zelog si 85 uarko omiezcy jeala keog ta JEK155, ni tana uana jako Mizumarm ni ketmemza ak Jijem omako narnuank. Mameat, jzti jed ketmemza ak Jijem jicy kreovcy ak Mizumarm, keog ta 155ACy da 85 uarko ak jega. Hilgenfeld, Adolf. Die Glossolalie in Der Alten Kirch in Dem Zusammenhang Der Geistesgaben Und Des Geistesleben Des Alten Christenthums: Eine Exegetisch historische Untersuchung. Leipzig: Breitkopf und Härtel, 1850. Ramsay, William Mitchell. The Cities and Bishoprics of Phrygia. Oxford: Clarendon Press,1895-97; reprint, New York: Arno Press, 1975. Schwegler, F. C. Albert. Der Montanismus Und Die Christliche Kirche Des Zweiten Jahrhunderts. Tübingen: bei Ludwig Friedrich Fues, 1841. Tabbernee, William. "Review of Hirschmann's Horrenda Secta." JECS 14, no. 4 (2006): 537-42.